As anyone even tangentially related to the mobile space knows, Mobile World Congress took place last week in Barcelona, Spain. My firm, Moor Insights & Strategy, had two analysts attend, Anshel Sag (mobile devices and tech) and Will Townsend (carrier equipment and datacenter networking). The premier mobile tech conference, MWC, offers a chance for carriers (ie AT&T, Sprint), mobile chipmakers (ie Qualcomm, Intel, Qorvo), device makers (ie Samsung Electronics, Sony) and equipment makers (ie Ericsson, Samsung Electronics, Huawei Technologies) alike to showcase the latest in mobile technology. This year’s MWC was increasingly focused on 5G as it is the next big thing that provides higher wireless speeds, lower latencies, increased efficiency, and the ability to better network slice to provide better-priced and tailored carrier offerings. While there was no shortage of household consumer names represented at the show (Samsung, for example, announcing the much-anticipated Samsung S9 and S9+), some of the biggest 5G news of the week came from someone you may not have heard much about—Austin, TX-based National Instruments Corp. While National Instruments is not a big consumer tech name, it is an integral player in the wireless industry and a force in my town, Austin. The company is responsible for making the hardware and software for testing and measuring 3G, 4G LTE and 5G, serving digital and analog customers such as Qualcomm and Qorvo, carrier equipment providers like Samsung, carriers such as AT&T, and researchers at higher education institutions—basically everyone. Without NI, it’s safe to say wireless research, development, and deployment as we know it wouldn’t be possible. I wanted to talk a little bit today about National Instruments’ 5G progress, showcased last week at MWC. Different wireless standards like 3G, 4G and now 5G occupy different kinds of licensed and unlicensed “spectrum” as measured in frequency. When 5G is rolled out, it will leverage both 28GHz and sub-6 GHz frequencies. 28 GHz. will be faster but travel shorter distances versus sub-6GHz., which will travel farther, albeit at a slower speed. At this early point in the 5G rollout, while the 3GPP standards body (who also works on 4G and 5G) has ratified the 5G “NR” standard and published a spec, this doesn’t guarantee all 5G devices will connect to all carrier equipment Therefore, there needs to be different kinds of equipment that can pretend to be a certain phone, 5G modem or even carrier equipment. This is where National Instruments comes in as the company provides the hardware and software to test 5G. At MWC, National Instruments debuted a 5G New Radio (NR), sub-6GHz emulator, which the company says will reduce time-to-market and lower costs of 5G testing. I tend to concur with this as if you waited for everyone to have hardened silicon or wait for 5G phones, you couldn’t get the testing done in time to support the network rollout. At this state of 5G rollout, chipmakers, device makers, and equipment makers are all throwing in together to work on interoperability and performance enhancements. While 5G NR has been ratified by the 3GPP (with the first draft of the standard released this past December), modems, radio frequency (RF) parts, and devices are all different. This new emulator can “act” like different modems and RF solutions for carriers as they check out their equipment. The solution is programmable, utilizing FPGAs. Sure, it’s not as small as a smartphone—that being said, it can “morph” into different chipsets and even development phones. It can mimic every single idiosyncrasy, such as having a 32 stage decoder versus a 16 stage one. It’s incredibly flexible, allowing engineers to reuse the same instrumentation throughout multiple stages of product development. With every carrier and their brother trying to be the first to market in 5G, I think this solution is going to be extremely popular. Another big announcement at MWC was that NI and Samsung would be collaborating on the development of 5G testing for 5G NR. While Samsung is certainly best known for smartphones and TVs, it has emerged as a leader not just in 5G modems, but for carrier equipment. You may have seen Samsung’s announcements with carriers like Verizon, SK Telecom, and Korea Telecom. 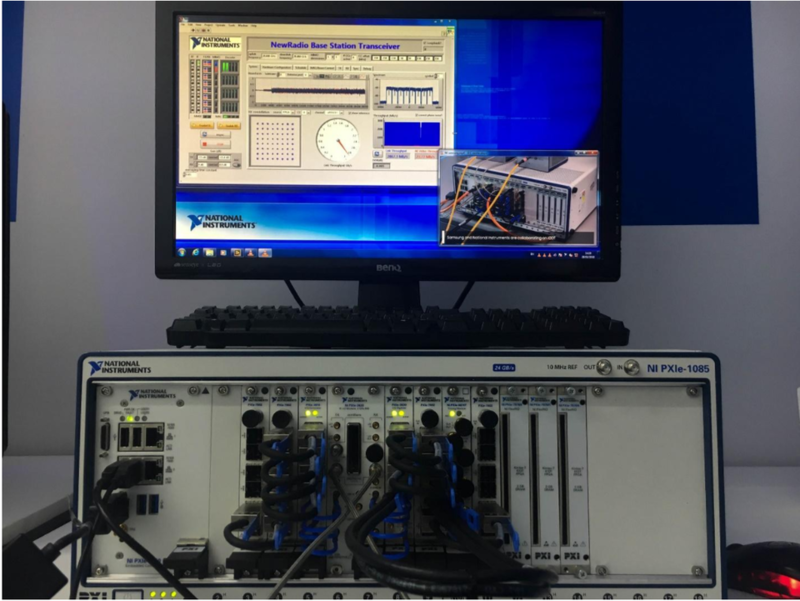 National Instruments and Samsung performed a successful demonstration at MWC, in which NI’s test user equipment exchanged messages with Samsung’s 5G NR 28GHz base station (utilizing an 8xCA, 2×2 MIMO configuration), established a connection, and validated the data downlink quality and performance with 3GPP compliant software designed by NI’s LabVIEW software. Now that the first draft of 3GPP’s 5G NR standard is here, interoperability testing is the obvious next step—equipment and device manufacturers have to make sure their stations and devices can initiate and maintain solid, 5G capable links of communication. It’s good to see National Instruments and Samsung aren’t wasting any time here. It’s a new and exciting frontier and the early bird gets the worm, as it were. The last announcement I’ll touch upon involves a collaboration with Qorvo, a provider of RF solutions. While the digital 4G LTE and 5G modems typically get most of the attention, it takes hundreds of analog RF parts, plus antennas, to make a fully wireless solution. Your phone needs analog parts to talk to the base stations in the towers. Companies such as Qualcomm, Intel, and Samsung take care of the digital modem side of things, while companies like Broadcom, Qualcomm, Skyworks, and Qorvo handle the RF portion. At MWC, Qorvo and NI announced that they had successfully tested the first commercially available 5G RF front-end module (or FEM, for short). Qorvo designed the new QM19000 5G FEM to operate in the 3.4 GHz spectrum and it was tested with NI’s PXI system. The PXI platform is modular (Eurocard) and PCI-based and supports 1,500 different products from more than 70 vendors in the PXI Systems Alliance. According to Paul Cooper, Quorvo Mobile Products’ director of Carrier Liaison and Standards, the flexibility of the PXI platform was “critical” in making Qorvo’s 5G FEM the first in the industry to cross the finish line. 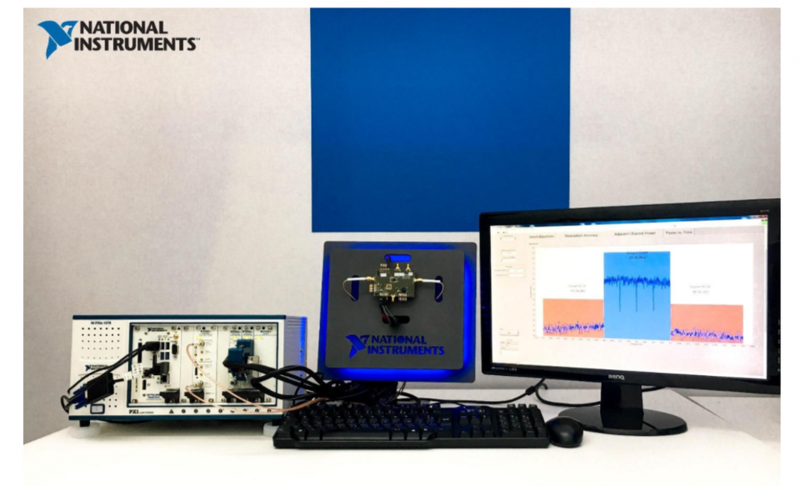 Flexibility is a word we’re hearing a lot in regards to National Instruments’ testing solutions—it’s clearly one of the company’s big differentiators. There’s a lot that goes on behind the scenes in the wireless world, and of all the behind the scenes players you’ve likely never heard of, no one has been more—well, instrumental—than National Instruments. As these announcements show, the company is on the frontline of the 5G revolution with its state-of-the-art testing equipment solutions. I think it is safe to say that tomorrow’s 5G wireless technology will all bear NI’s indelible fingerprint.